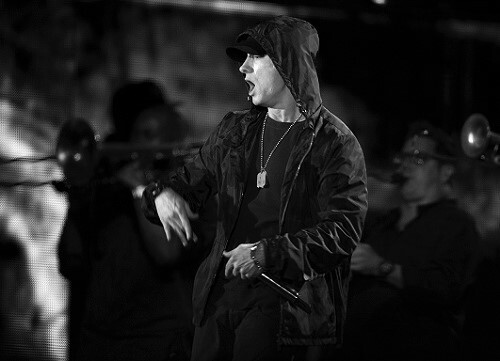 Eminem gets his day in court over claims that New Zealand’s National Party used his hit song Lose Yourself without permission in a 2014 campaign video. Various Kiwi news outlets are reporting that the trial will begin 1 May 2017 at the Wellington High Court. According to TVNZ, the trial is expected to last for three weeks. Representatives of Eight Mile Style, Eminem’s publisher, and lawyers for the National Party were at the High Court on Friday for a private hearing, The New Zealand Herald reported. A spokesperson said in 2014 they had never allowed the song to be used for any political campaign, reported Radio NZ. However, the party claims they had licensed to use the backing track to the 2014 video, getting “library music” from Beatbox, an Australia- and Singapore-based production music supplier. “We think these guys are just having a crack and have a bit of an eye for the main chance because it's an election campaign,” said National Party campaign manager Steven Joyce in 2014. Eminem isn’t the only popular artist who has claimed unauthorised use of their song in a political campaign. After the Republican National Convention in July, the band Queen told Donald Trump’s use of the song We Are The Champions on opening day was unauthorised. Adele, Neil Young, REM and Steven Tyler had also told the Trump campaign to stop using their songs. Bruce Springsteen also famously complained about Ronald Reagan’s use of Born in the USA. Performing rights organisations typically have the authority to license songs to be used in events such as political rallies via political entities licenses. To license for use in ads, politicians or political parties would need to contact the song’s publisher and in some cases the artist’s label as well. Through the copyright of the song, an artist may choose to ban certain or all politicians and parties from using their work. by Audio_Harry 3/04/2017 8:41:50 p.m. I still don't fully understand why this is going to court. The actual music track; which was composed by a 3rd party, was purchased by the National Party from an Australian music publisher. The music track in question sounds similar to the Eminem track, but the National Party didn't use Eminem's music. Any copyright infringement for the music track that sounds like the "Lose Yourself" track, must surely need to be addressed with the composer and the music publishing company? I have been using music from this same music publisher for use in TV broadcasts for a few years now and fees are paid accordingly. There are a number of music tracks on the hard drive from the publisher that one could say sounds similar to well known commercial music. The fact that this is heading to court next month is deeply concerning to me and those in my industry who up until this suit, believe we are legally using music from this and other production music publishers.